Currently there is a debate raging about the pros and cons of Save-on-Meats in the Downtown Eastside. The latest is a polarizing sandwich token program to help feed the poor. According to the plan, restaurant customers can purchase tokens from Save-on-Meats and donate them to people in the neighborhood. Critiques have been made here, here, and here, as well as at The Mainlander, with Peter Driftmier’s “Beggars Can’t be Choosers” (Peter used to be a sandwich maker at Save-on-Meats). The reception of these debates runs a winding path but gravitates to the falsely-posed question of whether people “like” or identify with the entrepreneurial genius behind Save-on-Meats: Mark Brand. “The frontier,” Neil Smith wrote in his New Urban Frontier, “represents an evocative combination of economic, geographical and historical advances, and yet the social individualism pinned to this destiny is in one very important respect a myth.” Mark Brand, treated as either a hero or villain of the urban frontier, enters the field of mythology and becomes a new Jim Green figure for our time, garnering a similar respect for balancing “social” and business concerns (if Green started in politics and moved into business, Brand seems to finish where Green left off and moves back into “politics”). As with so many other gentrification projects, Mark Brand’s numerous upscale Gastown enterprises have come under attack from the neighborhood. Outside the neighborhood the conflict is read differently. Anyone scanning The Province or listening to the radio debates would be surprised to know that Brand owns multiple upscale businesses in the DTES — six to be precise. In light of a larger shift, the underlying conflict about Save-on-Meats is clearly not about the intentions of Mark Brand, the nutritional value of his food, or the latest Oprah appearance. The conflict is about gentrification. In response to the resistance against gentrification, Brand has been forced to make token concessions, marketing Save-on-Meats as a community oriented “social enterprise” with affordable prices on certain items. This pressure has been re-cast as a drama within the mind of one man, but to the people who become reno-victed and displaced from their community it is all too clear that blaming an individual business owner or a handful of consumers for gentrifying their block is not sufficient to explain the force of displacement. When a community is displaced it is not an isolated misfortune, it is systematic. Gentrification is always a class effort. A year or two ago I posited in a magazine article that new restaurant development in these parts was on its way. I likened the advance to that of an invading force employing a pincer movement around the most seemingly prohibitive blocks of the DTES…effectively enveloping the whole of the DTES with a ring of new eateries (for the military historians out there, remember the Battles of Marathon, Cannae, and The Falaise Gap). Thus surrounded, the main concentration, what the eminent strategist Von Clauswitz would call the “schwerpunkt”, has been getting ready to burst eastward on Hastings proper for the past year (witness the comings of Wildebeest, Save On Meats, Bitter, Acme Cafe, etc). All that remains to be conquered – to put it indelicately – are the blocks within the ring, at the center of which lies Fat Dragon, with its 12 SROs above. Despite these frank depictions of naked displacement, defenders of gentrification continue to be surprised and scandalized by the ongoing political resistance of the poor against displacement and poor-bashing. The poor step out of their image as passive recipients of charity at precisely those moments when their docile portrayal is most crucial for the success of the win-win ideology of gentrification. As Frances Fox Piven wrote in her famous Poor People’s Movements (1977), the political organizing of poor people brings the poor onto the historical stage of politics. “Not simply as victims but as actors,” she writes. In contrast to ongoing popular mobilization, charity obscures the lives of poor people and erases the causes of poverty, allowing politicians, developers or business owners to shrewdly invoke the “voicelessness” and “marginalization” of low-income people. 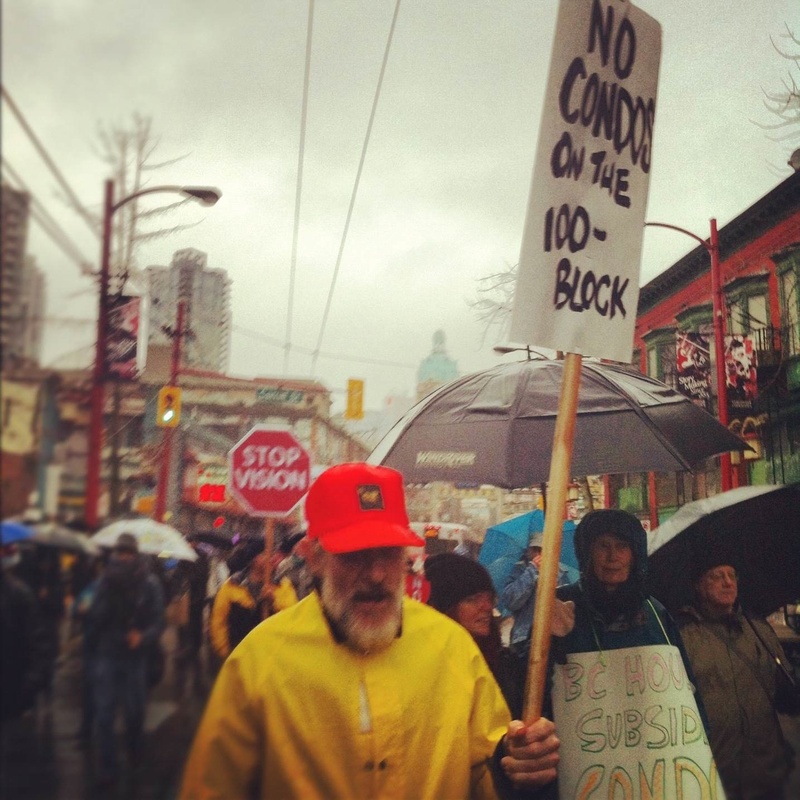 Rather than being “without a voice,” the fightback against condos in the DTES has been relentless. It would take a person hundreds of hours to watch poor people’s speeches to city council alone this past year, not to mention protests, meetings and endless hours of organizing. In response to the opposition, the corporate media and their Vision supporters criminalize and vilify the poor. When possible, they ignore the struggles of the poor, and this is especially true in the wake of punctuated political events, protests and interventions, like the eviction of Mark Brand from a DTES Town Hall earlier this year. Alain Badiou rightly argues that the first reactionary stance towards a political event is to deny its existence. The denier of popular politics is the “obscure subject,” who, in the wake of an event, attempts to erase any trace of its traces. A perfect expression of this “obscure subject” can be found on the pages of one of Vancouver’s yuppie magazines, Scout Magazine. In response to Peter Driftmier’s Mainlander argument against Mark Brand, Sean Orr questions Driftmier by suggesting that, in reality, nobody really knows what DTES residents want. “Has anyone asked the locals what they think?” Orr asks, adding: “I’d be glad to eat any sandwich given to me.” For one, it is obvious that poor people should use Save-on-Meats’ food vouchers — that is not the debate and we don’t add anything to Richard Cobb’s statement in his The Police and the People (1970): “Analysts, few of whom have ever experienced hunger, have no business blaming poor people for accepting, even gratefully, the products of bourgeois charity.” To ignore their resistance, as Orr does, is worse. In her book Poor-Bashing (2001), Jean Swanson defines poor-bashing precisely as the refusal to recognize the active demands of the poor: “Poor-bashing means ignoring people who are poor when they propose what they need.” This refusal is especially sharp in Vancouver, where Vision and their creative-class following wish away the problem of gentrification and eviction while portraying the poor as undeserving (except in the case of charity). We might quote Zizek’s popular critique of charity, but it would be more valuable to look at the actual movements of poor people. Last week dozens marched to the CBC during their annual Food Bank Day to demand “Justice not Charity,” just as they did last year. Brand’s food token program is a coup of ideology because it responds to the active demands of the poor precisely by recasting those same actors as passive recipients of his charity! In this way, Brand’s token scheme is a metaphorical box that contains hidden secrets of our city. Poor people’s struggles drive the politics of class-divided Vancouver, yet the rich legitimize their power in the diversions of charity, token inclusivity and the vain play of high-profile personalities. This is why the debate is not about Mark Brand, or even the efficacy of his tokens. Everyone knows it is about something far greater. Images by Erica Holt, 11 Dec 2012, March against Condo Gentrification & BC Housing bailout of Sequel 138. Posted in Analysis, Art & Culture, City Hall, Downtown Eastside, Gentrification, Uncategorized. Bookmark the permalink. very informative and well rounded. nicely done the both of yas. The DTES is the way it is because of government policy, crappy mainstream capitalist media and mass apathy and assholes in a classist-oppressive society. I hope someday that yaletown slips into the ocean. This is truly one of the stupidest things I have ever read. In the sense of being wilfully ignorant. Wow. thanks for the clarity, because I would not have a clue what you were referring to. Raises her fist for enlightenment and less oppressive dogma! I cannot conclude that this article suffers from reverse-NIMBY-ism. I find that absurd. There are no terms of economic, cultural, or historical equivalence that make the DTES comparable to another geographic region of the city. I can certainly identify the relationship of posterity between this piece and the earlier Peter Driftmier article on Save-On-Meats, however, I am not sure that S-on-M (nor even Mark Brand) is the ultimate object of critique for the authors here. I think it is an important insight to identify Mark Brand’s S-on-M sandwich token as a “creative solution” to cope with mounting political resistance as a newly inoculated form of bourgeois charity. I agree that the Mainlander’s perspective on the politics of sand-wich making and sand-wich eating is more politically valuable to the (highly organized and committed) resistance movement against gentrification in Vancouver than anything anyone in Scout Magazine has to say about the latest newly opened restaurant just on the outskirts of the DTES. I agree that Mark Brand should be politicized and not treated as just another benign independent business owner. Why then can I still not identity the highly obscure (if not invisible) object–of–rage in this piece? do I detect rage at the consumer writ-large? even of this article itself? “98 likes” and we still cannot afford to buy the (implicitly poor-bashing) “bourgeois sucker” who purchases a S-on-M sandwich AND a S-on-M token a short sidewalk education on why he or she is not absolving his or her christian guilt (nor improving his or her karmic footprint) over the alarming class divide in the city? I am crying in tragedy. “98 likes and 14 tweets” and we can still not afford to have that dinner we’d always said we’d have with our favourite marxist-materialist professor from grad school? I am crying in farce. Can we all just stop talking about this totally fake, attention whore hipster Mark Brand. We get it already he is just like Jim Green, except for the fact that Brand is an uneducated, self righteous bartender and business owner, who can’t go two minutes without going on tv promoting himself. On “Diners and Dives” I’ve got 10,000 square feet and used to come here all the time as a kid referring to save on meats. Yet Brand moved here in 2005 or so. On Gastown Gamble, one week he hires people from the neighborhood and says he has everything invested and doesnt own a home and the next week he fires those same people and thinks hes going to buy the building for 5 million. He has businesses that exploit east van pride when he is not even from vancouver. Not to mention the endless interviews, ted talks and public appearences. We all get it Mark you’re cool and driven, but please stop pretending you’re the voice of a neighborhood or that your business is some sort of social ground zero for the dtes. You took an old business, remodeled it with a retro hipster theme and by the looks of it have done a good job. But please stop pretending your working for the greater good by selling $12 dollar martinis to the new coolest neighborhood in north america. “And now the time has come. Gastown restaurateur Mark Brand has signed a 20-year lease on the entire four-storey building. After renovating for close to a year, the main floor will reopen this spring with a butcher shop, restaurant and take-out window that Brand envisions serving the residents of the Downtown Eastside. The second floor will become a commissary kitchen supplying not only the main floor but also the three nearby Gastown restaurants Brand is a partner in: The Diamond, Sea Monstr Sushi and Boneta. And perhaps the most innovative part of the operation will be one of the upper floors, which will house an “incubator” kitchen aimed at helping burgeoning entrepreneurs develop new food products and learn business skills. Another upper floor will serve as ­general office for all Brand’s businesses. I agree that this SOM debate really is just a proxy for the broader discussion of the economic viability of the Lower Mainland itself, and inherent in that is a class struggle… So, as a newcomer to Vancouver I am wondering whom the authors consider to be “rich?” For example, where does someone working full-time making $36,000/year and paying 40% of take-home pay for rent fit in? I think you need an editor. I could not possibly read all of that. I guess it has something to do with my addiction to Jon Ferry—now that man has a good editor. Short, to the point. Irregardless (I suppose I need an editor, too), from what I did read, you miss the mark. In a free society, land-holders are not held hostage by renters, and that is what the residents-by-sufferance (renters are not freeholders nor do they have the same right) of the DTES are. Indeed, our generous residential tenancy act goes too far—if a landowner wants to evict people, he should be able to so do, for any reason whatsoever. Once we get property rights into the Charter, this nightmare will be over, thank goodness. The poster above claiming you’re NIMBYs is thoroughly correct. Where some people (rather rightly) want to keep drug-abusing transients out of their communities, you want to keep capital and progress out of your community—for whatever reason, you like living in a den of filthy people with lung infections who smoke cigarettes—I mean, I have never seen a filthier place than the DTES, and that is largely due to the choices that many of its residents make: to smoke cigarettes, to use drugs, to engage in self-destructive behaviors. The first step for anyone who wants to get ahead in this world is to take personal responsibility. It isn’t the Government’s fault. It isn’t a “systemic problem.” The problem is you. You won’t work; you won’t put in the effort. The DTES is decadent and depraved—and thank goodness for the few beachheads of progress we have in the place now. We need more. They are coming. Your 20th-century old-left “organizing” tactics will prove futile—all you will have done is wasted the time of the uneducated poor. To be educated and consciously choose to be poor is one thing, I suppose, but to be educated and to take advantage of the marginal intellectual skills of the uneducated poor, to herd them about in the old-left hypnotic style, in a world where the old-left is no longer effective borders on sociopathy. To all of you marginal, uneducated poor people out there: you are being had. The university-socialist “social organizers” get off on herding you around like cattle, having you march in the street, treating you like trained dogs. If you want to get ahead in this world, start working. There’s no such thing as a free lunch. I love reading these comments, its like a hot tub time machine back to the Cultural Revolution and the Little Red Book. I’m appalled I ever said that.